The government is seeking to partner with private sector players to complete the National Optic Fibre Backbone Infrastructure (NOFBI) according to ICT CS Joe Mucheru. So far, the ICT Authority has managed to connect 57 towns in 35 counties to the fiber backbone. The connection is at a cost of Kshs. 6 billion and has so far covered 4300 kilometers with 2,100 kilometers earmarked for completion by June 2016. Citizens visiting counties will now have it easy in accessing e-government services with communication across counties improving. The implementation of phase 2 of the project will also build a 500 KM dedicated fiber network for the military. Part of the completed Phase 1 is already in use in the national government, Telkom, Safaricom, Jamii Telecom and KENET utilizing more than 3,000KM of the cable. The operations and maintenance of NOFBI Phase 1 is being handled by Telkom for the project initiated seven years ago. Once the NOFBI is completed, the last mile connectivity under County Connectivity Project (CCP) will take over. The ICT Authority created road maps for Counties in Kenya to ensure the supply for e-government services is in tandem with broadband requirements. The ICT road map project which kicked off in March 2015 sought to collect data on the status of each county as well as gather information on planned projects in each county. In addition, the roadmap outlined an ICT development plan for each county for a period of six months. Already, private sector players are laying their own fiber in some counties. Just this week, Liquid Telecom announced completion of a 21 kilometer fibre network in the Garissa County CBD ultimately becoming the county’s first Metro Fiber optic. 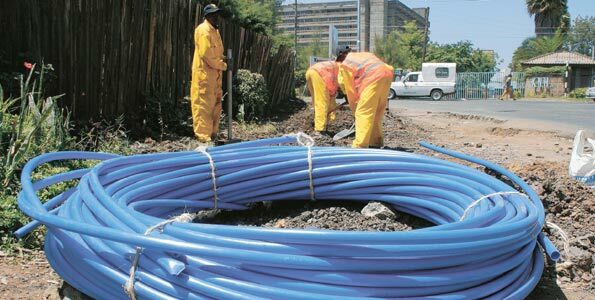 The fiber network so far connects 30 clients with another 74 Garissa connections in the pipeline according to Liquid Telecom. Other projects seeking to increase fiber outlay in Kenya include one in partnership between Kenya and South Sudan. Through the Eastern Africa Regional Transport, Trade and Development Facilitation Project fiber optic cable will be built from Eldoret to Lodwar with the South Sudan government extending it from the border town to the Capital Juba.